A Chinese TV reporter charged with slapping a delegate at the Tory party conference has had the case against her dropped. 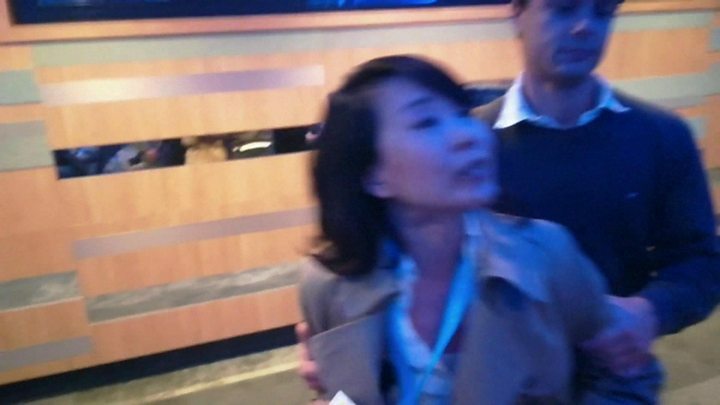 Linlin Kong, 48, was arrested at the Conservatives' annual gathering in Birmingham in September. She reportedly slapped the man at a discussion about political freedoms in Hong Kong, and was due to appear in court on a common assault charge. However, prosecutors said there was insufficient evidence to convict her. Ms Kong, a London-based correspondent for official state broadcaster CCTV, had been due to appear at Birmingham Magistrates' Court. A Crown Prosecution Service spokeswoman said: "This case was originally charged by the police. "The CPS subsequently reviewed the available evidence and determined it was insufficient to provide a realistic prospect of conviction and therefore discontinued the case." At the time, it was reported Ms Kong began heckling activist Benedict Rogers - head of human rights group Hong Kong Watch - during a speech. The group has said Ms Kong called Mr Rogers a "liar" when he told the room he was "pro-China" despite being a government critic. Enoch Lieu, a student party volunteer, alleged on Twitter he was "slapped in the face" by Ms Kong when he asked her to leave. Video circulated of the altercation did not show the alleged slap, but showed the reporter arguing with Mr Lieu while being restrained by delegates. CCTV has quoted an unnamed lawyer as saying Ms Kong had just been carrying out her duties and conference organisers had acted "inappropriately". A state media report has alleged she was "even physically assaulted". The Chinese Embassy has called her removal from the Tory conference "completely unacceptable", adding: "In a country that boasts freedom of speech, it is puzzling that the Chinese journalist should encounter obstruction in such a way." Kerry Allen, from BBC Monitoring, has said that in China people had praised Ms Kong for defending Chinese sovereignty over Hong Kong. "I support Kong Linlin for her patriotic actions!" one user says. And another calls her a "heroine" saying "She hit the hands of a publicly provocative Hong Kong separatist." One user is more broadly critical of patriotism "being used politically". He says: "I hope that in the future, Chinese will be patriotic but respect the order of things. The road is long and slow." In October she said there were strong indications social media commentary was being influenced by China's so-called 50 Cent Party - a legion of commentators paid small amounts to post messages supporting the government.